In this episode of Getting Money Right we’re continuing our conversation on investing for retirement. We want to equip you with modern philosophies for investing and show you where to start. This series will give you the confidence to go out and make some retirement investing decisions and teach you what it takes to become a millionaire. Never invest in something you don’t understand. Diversify your investments - don’t buy one stock or invest into one specific investment (don't put all your eggs in one basket). Mutual Funds well diversified across a number of stocks is a great place for investing long-term. Although past performance isn’t a guarantee of future performance in stocks or bonds, 100+ years of data should give investors the confidence to invest in the stock market. If the stock market has averaged 9%-11% then it is possible for the average American to retire with $1,000,000 or more. How can you accumulate so much, so quickly? $10,000 investment at 10% interest earns $1,000 in one year. $11,000 investment at 10% interest earns $1,100 in the second year. $12,100 investment at 10% interest earns $1,210 in the third year. Each year your investment compounds (grows) and grows exponentially. 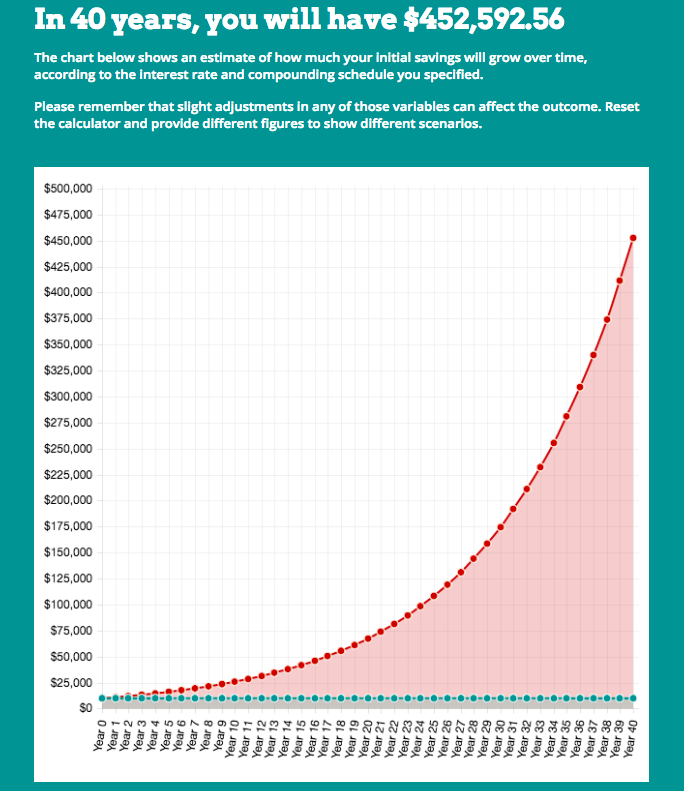 In 40 years $10,000 investment grows to $452,592.56. Rule of 72 is a shortcut to estimate the number of years required to double your money at a given annual rate of return. $8,000 in Year 27, and so on. $200,000 - at 7 years. $400,000 - at 14 years. $800,000 - at 21 years. $1,600,000 - at 28 years. This is without any additional investment added outside of interest growth. Index basically means list…. So there are a list of stocks and the index fund uses a computer to buy that list of stocks and only buys or sells when the list changes. Buying an S&P 500 index fund, you’re invested in 500 of the top companies in the U.S.
Dow Jones Industrial Average (“The Dow”) is an index of the top 30 companies in the U.S. and it’s been around since 1896. Index funds are managed by computers mostly so the expenses are very low compared to other mutual funds. Investing in an index fund is a form of passive investing. Because a person isn’t actively managing and trying to find the best stocks, it’s just a computer picking off of the list. A majority of actively managed mutual funds fail to beat broad indexes, like the S&P 500. We know that some hedge fund and mutual managers will beat the overall market, we just don’t know which ones it will be. We don’t know who the next Warren Buffet or Philip Fischer will be.